You know, the more we think about it, the more we seem to have in common with Mark Allison. Granted, he’s really good at running and we, well, we aren’t. But look beyond that and there are lots of similarities. 1) Mark likes big numbers and so do we. His is 3,100, the number of miles he is planning to run during his coast-to-coast dash across the United States. Ours is 100,000,000, the number of OMs we’re aiming to create here in our studio in Saunderstown. 2) Mark isn’t afraid of a challenge and neither are we. His is travelling 32 miles a day, every day, for 100 days, under his own steam – that is, on foot, as he inches towards New York from his starting point in California this weekend. Ours is populating the world with our OMs, sending them to all the corners of the planet, to every country, every continent, near and far and to all points in between. 3) Mark likes to help other people and has a penchant for good causes and so do we. His aim is to raise at least $81,000 – for St Benedict’s Hospice and The Children’s Foundation, good causes close to his heart in the UK. He has yet to start running, but already has a shade under $50,000 – in the bag (it’s a big bag, with plenty of room remaining). Our ambition is to help him to reach his target during the coming weeks while continuing to support some of the other causes we believe in, not least Saturday’s Child, the up-and-coming non-profit organization dedicated to helping children with cancer. 4) Mark appreciates an OM and so do we. Prior to departing the UK this week, Mark chose Chara – made right here, in our studio in Saunderstown – to be his lucky-charm and mascot this summer. You don’t need us to tell you what OMs mean to us here at our Rhode Island HQ. We’re just glad that Mark recognised our OMs’ attributes and hope our friendship and support can help him on his long and winding road across our great country. So there you have it: an athletic Englishman and a creative American, so little in common, you’d think at first glance, but beneath it all, under the surface, connected in countless ways. Our ambition, our determination, our respective attempts to beat the odds – all these things link us, perhaps that’s why the Run Geordie Run project struck a chord when we first heard about it. Perhaps that’s why we’re so excited about Mark’s astonishing undertaking; perhaps that’s why we’re so keen to chart his progress, to spread the word and to help him towards his fundraising goals. Have you been inspired by Mark’s project? Do you feel connected? Perhaps your respective paths are destined to cross this summer – after all, his route is set to take him through 14 states. 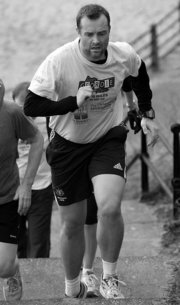 Perhaps you’d like to make a donation at justgiving.com/rungeordierun1 or justgiving.com/rungeordierun2. But whatever you do, we just hope that you feel as connected as us to a project to applaud and an effort to embrace. Here in Saunderstown, RI, we’d like to wish Mark well for his forthcoming adventure, set to start with Sunday’s opening leg, 32 miles from Huntington Beach, California, the first of many. Run like you’ve never run before. Remember you’re not alone on the long road that lies ahead, because for all our differences, we are all connected!